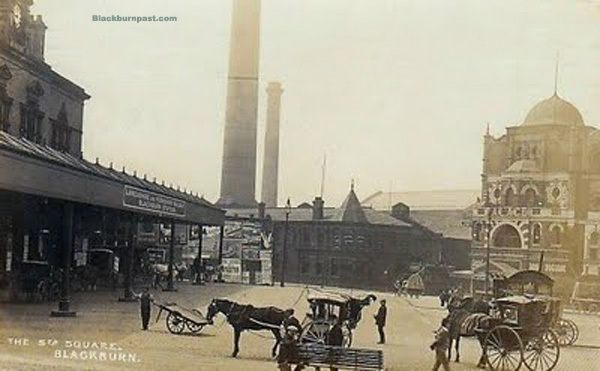 A nice old scene from a time long ago, showing the railway station, the electricity works and the Palace Theatre. Probably dates to the turn of the 20th century. I don't think I've ever seen a photo of the boulevard as old as this. The horse and cart taxi is very quaint. Does anyone know when the massive chimney disappeared? I don't know when the massive chimney disappeared, I'll try and find out, but not too confident that I'll find the answer. The building slightly to the right of the center of the photo with the pointed roof was a coffee bar in the 60's it was called the K.J.Coffee Bar but I cant find any photos of it as the coffee bar anyone out there got one? Or any other information about it ? There's a blue plaque on that building now John. It was the old Electricity Works long, long ago. I never knew it had been a coffee bar. Is there nothing on Cottontown? It's a fantastic photograph! Hard to believe this is Blackburn (even though much of the left hand side of the photograph is still there). This might be a bit late, but I got this from Cottontown..."Behind the domed bulk of the Palace Theatre can be seen the chimney and wooden water cooling tower of the town's electricity works which opened on the site of the old gas works in Jubilee Street in 1895. The 250ft chimney was demolished in late 1925 and early 1926."